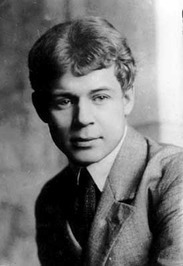 Sergei Yesenin was born in Konstantinovo in the Ryazan Province (Губерния, Gubernia) of the Russian Empire to a peasant family. He spent most of his childhood in his grandparents' home. He began to write poetry at the age of nine. In 1912, he moved to Moscow where he supported himself working as a proofreader in a printing company. The following year he enrolled in Moscow State University as an external student and studied there for a year and a half. His early poetry was inspired by Russian folklore. In 1915, he moved to St. Petersburg, where he became acquainted with fellow-poets Alexander Blok, Sergey Gorodetsky, Nikolai Klyuev and Andrei Bely. It was in St. Petersburg that he became well known in literature circles. Alexander Blok was es Sergei Yesenin was born in Konstantinovo in the Ryazan Province (Губерния, Gubernia) of the Russian Empire to a peasant family. He spent most of his childhood in his grandparents' home. He began to write poetry at the age of nine. In 1912, he moved to Moscow where he supported himself working as a proofreader in a printing company. The following year he enrolled in Moscow State University as an external student and studied there for a year and a half. His early poetry was inspired by Russian folklore. In 1915, he moved to St. Petersburg, where he became acquainted with fellow-poets Alexander Blok, Sergey Gorodetsky, Nikolai Klyuev and Andrei Bely. It was in St. Petersburg that he became well known in literature circles. Alexander Blok was especially helpful in promoting Yesenin's early career as a poet. Yesenin said that Bely gave him the meaning of form while Blok and Klyuev taught him lyricism. In 1916, Yesenin published his first book of poems, Ritual for the Dead (Radunitsa, Russian: Радуница). Through his collections of poignant poetry about love and the simple life, he became one of the most popular poets of the day. His first marriage was in 1913 to Anna Izryadnova, a co-worker from the publishing house, with whom he had a son, Yuri. Later that year, he moved to St Petersburg, where he met Klyuev. For the next two years, they were close friends, living together most of the time. Some modern researchers suppose that Klyuev was the addressee of Yesenin's love letters. From 1916 to 1917, Yesenin was drafted into military duty, but soon after the October Revolution of 1917, Russia exited World War I. Believing that the revolution would bring a better life, Yesenin briefly supported it, but soon became disillusioned and sometimes criticized the Bolshevik rule in such poems as The Stern October Has Deceived Me. In August 1917 Yesenin married for a second time to an actress, Zinaida Raikh (later wife of Vsevolod Meyerhold). They had two children, a daughter Tatyana and a son Konstantin. Konstantin Yesenin would become a well-known soccer statistician. In September 1918, Yesenin founded his own publishing house called "Трудовая Артель Художников Слова" (the "Labor Company of the Artists of the Word"). In the fall of 1921, while visiting the studio of painter Georgi Yakulov, Yesenin met the Paris-based American dancer Isadora Duncan, a woman 18 years his senior, who knew only a dozen words in Russian. He spoke no foreign languages. They married on May 2, 1922. Yesenin accompanied his celebrity wife on a tour of Europe and the United States but at this point in his life, an addiction to alcohol had gotten out of control. Often drunk, Yesenin had violent rages in which he destroyed hotel rooms and caused disturbances in restaurants. This behavior received a great deal of publicity in the international press. His marriage to Duncan was brief and in May 1923, he returned to Moscow. He almost immediately became involved with the actress Augusta Miklashevskaya. He is rumoured to have married her in a civil ceremony, although he had not obtained a divorce from Duncan. The last two years of Yesenin's life were filled with constant erratic and drunken behavior, but he also created some of his most famous poems. In 1925 Yesenin met and married his fifth wife, Sophia Andreyevna Tolstaya, a granddaughter of Leo Tolstoy. She attempted to get him help but he suffered a complete mental breakdown and was hospitalized for a month. Two days after his release, he allegedly cut his wrist and wrote a farewell poem in his own blood, then the following day hanged himself from the heating pipes on the ceiling of his room in the Hotel Angleterre. He was 30 years old.